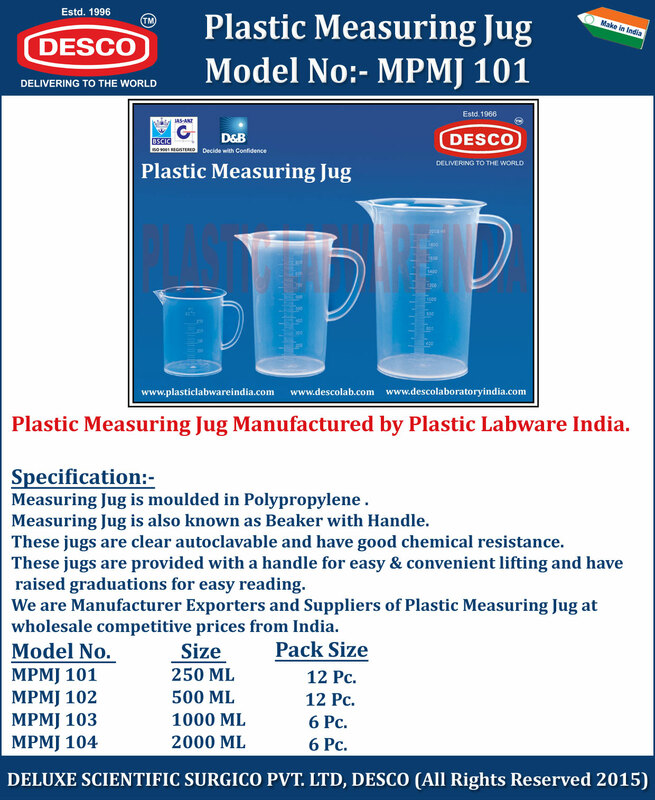 Measuring Jug is moulded in Polypropylene . Measuring Jug is also known as Beaker with Handle. These jugs are clear autoclavable and have good chemical resistance. These jugs are provided with a handle for easy & convenient lifting and have raised graduations for easy reading. We are Manufacturer Exporters and Suppliers of Plastic Measuring Jug at wholesale competitive prices from India. MPMJ 101 250 ML 12 Pc. MPMJ 102 500 ML 12 Pc. MPMJ 103 1000 ML 6 Pc. MPMJ 104 2000 ML 6 Pc.